This was a pleasant surprise. High quality product at a very affordable price compared to the expensive stuff in stores. The sheets are SO soft and have a nice shine to them. This set was perfect for our coastal bedroom theme! I purchased this set last year and I adore it. It never fails to bring compliments fro friends and relatives. Having everything you need in one set makes it an incredible value. This 24 piece set even has window panels to match. It also has several throw pillows that make the comforter set elegant. If you had to purchase the pillows alone, it would pay for the cost of the set! Color as shown. Sheets are thin but the comforter is nice. This set arrived quickly and with all the pieces. I was a little surprised to find the comforter thinner than expected based on the pictures but it works fine. The sheets and the bed skirt are VERY thin and I expect they will snag and tear easily so I'm treating them gingerly. Still, the entire set looks beautiful and for the price, it's a great deal. Very pretty but very fragile. The bed skirt really is not pretty at all. The comforter and pillows and valance all look great. I love it!!! Very luxurious looking. The price I got it at was incredible. I only rated it as a 4 star because the sheets are 100% polyester (which may have been included in the details, but I was unaware). I thought I wouldn't like them. I know how polyester can be. But after trying them out for a couple of weeks, I have found that they are comfortable too. This was a great purchase all around. Product, price, quality, communication, quick shipping, . I would highly recommend. 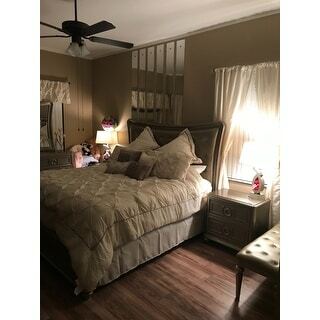 This comforter set is beautiful and came at a great price. what I suggest Place need in a guest room or a bed that will not be used much. Because after the first washing the stuffing in the middle all gather to one spot. And it is so difficult to adjust the feeling stuff in whatever is called to make the bed spread appear even. Overall pleased with purchase. Only complaint is the sheets aren’t soft and don’t stay on the mattress as they should. I would recommend the product. I’ve had this set for a year now and still loving it. It comes with curtains and everything. Nice, but a bit on the thin side. I honestly didn’t care for this bedding at all. The sheets were way too thing and the comforter was extremely itchy/uncomfortable. I gave it two stars because it is really pretty and I still throw it on top of whatever plain white comforter I’m using when guests come over. It’s basically a “for looks only” type of bedding. Low-end material. Looks nice from far away. This would be a decent spare room set. Material thin, I feel like if I pull on it, it will rip. Don't pay full price and as always, you get what you pay for. This set is even more beautiful than the pictures. I love high quality and for the price you definitely get your money’s worth and more. Everyone who sees our bedroom is in awe with the bedding and curtains and they are amazed how little I had to pay for it. I will continue to buy from Overstock. Absolutely gorgeous. I love this complete set. My bedroom feels like a royalty suite now. I ordered additional ones for my daughters. "Can you purchase additional euro pillow sham"
Unfortunately no, additional euro pillow shams are not available. Since this set is made with polyester it does not have a thread count. Its beautiful and I love the price!!! "can I get window curtains for 2 more windows"
Unfortunately additional curtains are not available.